Updated with comments from Gitga’at First Nation, Nathan Cullen and Shell Canada. Gil Island is a “critical habitat” for the world’s humpback whales, whose numbers are increasing in Douglas Channel, Wright Sound, Estevan Sound and Camano Sound and nearby waters, according to a study released Wednesday, September 11, 2013. The study also goes on to warn that potential tanker traffic through the “geographic bottleneck” on Douglas Channel to and from Kitimat could threaten that crucial “pit stop” for the humpback whales. The study, “Abundance and Survival of Pacific Humpback Whales in a Proposed Critical Habitat Area,” by Erin Ashe, of the University of St. Andrews, in Scotland, Janie Wray of Oceans Initiative on Pearse Island, Christopher Picard of the North Coast Caetacian Society in Hartley Bay and Rob Williams of the Gitga’at Nation Lands and Marine Resources Deptartment, is published in the jourrnal PLOS One. The research team estimated the abundance of Pacific humpback whales by using photo-identification surveillance of adult humpbacks. They found that the number of humpback whales in this region increased each year, and doubled from 2004 to 2011, resulting in a total of 137 identifiable whales in 2011. The survey was conducted year-round. Abundance was estimated only during the summer months of July to September, when the migrating whale population is largest. The survey focused on summer feeding regions in the northwestern BC coastal fjords that serve as a “pit stop” for whales between migrations. Migrating whales travel to the BC coast from calving grounds as far away as Mexico, Hawaii or Japan. After several months without feeding, the humpbacks arrive in BC, and, the study says, show “strong site fidelity to local feeding grounds” around the entrance to Douglas Channel. The study estimates there were once about 15,000 humpback whales in the North Pacific when whalers began hunting the animals. That number was down to 1,400 when whale hunting was stopped in Canada in 1966. “It is therefore good news that the segment of the population using our study area is growing and adult survival is near the limit that one would expect for this species. That said, although the population is recovering, there is no evidence that it has yet fully recovered to pre-exploitation levels in BC and we do not wish to become complacent.” the study says. Humpback whales may be facing increasing threats in at least one of their proposed critical habitats in BC. Numerous port facility expansions and new terminal proposals, including numerous crude oil and liquefied natural gas (LNG) export proposals, could substantially increase deep-sea shipping traffic through BC’s north and central coast waters. Such developments could exacerbate oil spill, acoustic disturbance, and ship strike risks to humpbacks. 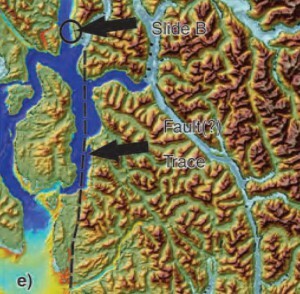 In particular, the Gil Island proposed critical habitat area where our work was conducted, spatially corresponds with all shipping routes leading to Kitimat, BC port facilities that are currently being considered by regulatory agencies for high-volume crude oil and LNG tanker traffic and other increased shipping activities. This also suggests that area-based management for cetaceans can effectively target small areas if these areas are chosen carefully. The corollary to this, though, is that a tendency for animals to be concentrated or aggregated in small areas lends them vulnerable to catastrophic events like oil spills and ship strikes. Critical habitats like the Gil Island waters are therefore a mixed blessing when high densities of whales are found in geographic bottlenecks that also funnel and concentrate shipping traffic. Anthropogenic threats to this must be evaluated not only in terms of the proportion of available habitat that this area represents, but also in terms of its critical importance to large numbers of whales for critical life-history processes. The risk and ecological consequences of an oil spill in this region would increase substantially if proposals were approved to ship large volumes of oil and LNG traffic through the Gil Island waters. Studies in Pacific waters similar to our study area suggest that oil spills can have severe and chronic impacts to cetacean populations and it is uncertain whether affected populations can recover from such perturbations. The study was based on what is called “community based science,” a cost-effective partnership between scientists, the Gitga’at Nation and other First Nations, NGOs and the Department of Fisheries and Oceans. As part of its Pacific humpback whale recovery strategy, DFO has proposed four areas as candidate critical habitat. One criterion for designating critical habitats within northern BC coast feeding grounds is that inlets are used for specialized ‘‘bubble-net’’ feeding behaviour (where the humpbacks create a fishing net of bubbles to catch their prey). At the start of the study, the team had noted that “mainland inlets have been somewhat under-represented in habitat studies” and so they began working on the photo-identification of the humpbacks, using two research groups, the North Coast Cetacean Society and the Gitga’at Lands and Marine Resources Department. Surveys were conducted as weather permitted throughout the year from April to November (with occasional trips in February, March and December), from 2004 to 2011. 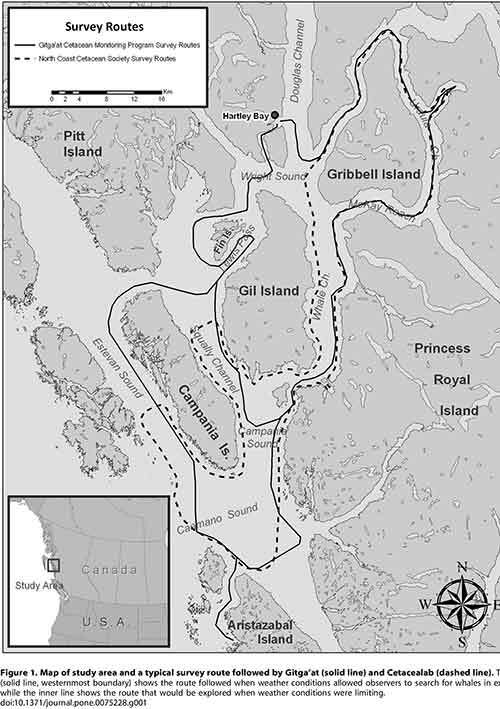 The aim of the study was to “collect as many high-quality photographs of individually recognizable humpback whales as possible within the study area [referred to in the study as ‘Gil Island waters’’] from Estevan Sound in the west to Ursula Channel in the east. One 27 foot and one 18 foot boat were used to conduct the surveys. A total of 374 photo- identification surveys conducted over 47 months resulted in a catalogue of 177 high-quality, unique identifications of individual humpback whales. Information also came from “an informal sightings network including local fishermen and tourism operators who reported humpback and killer whale sightings over VHF radio;” hydrophones monitored for vocalizing humpback whales; and visual monitoring from the land-based Cetacealab facility on the south end of Gil Island. When a humpback was sighted, they were identified by the fingerprint like tail flukes and the numbers cataloged. The study was funded by grants to Cetacealab and Gitga’at First Nation from Julie Walters and Sam Rose, and from Fisheries and Oceans Canada (Cetacean Research Program, Species at Risk Program). There was also support from King Pacific Lodge. The waters around Gil Island are especially rich habitat for humpback whales, due to high abundance of their preferred foods, such as krill and herring and due to the remote nature of the coastal fjords. 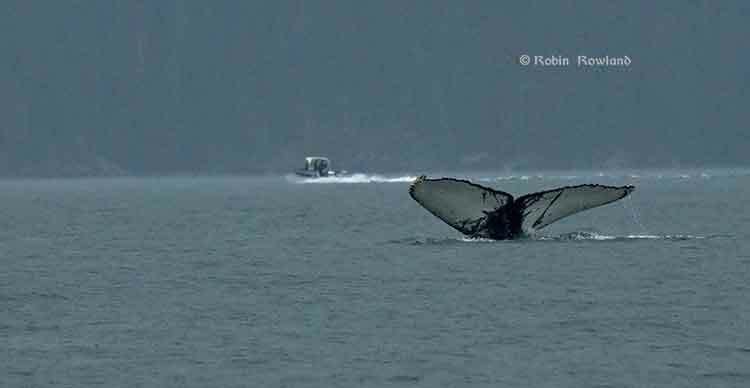 Humpbacks, which rely on acoustic communication, are sensitive to noise pollution from ship traffic. In his biweekly conference call with Northwest BC reporters, Skeena Bulkley Valley MP Nathan Cullen said: “I don’t get a sense from the way that the federal government has designed this [referring to Enbridge Northern Gateway] project, that on the marine side, any of these things are important to Mr. Harper. When you start to place down the most important values and certainly for British Columbians and Canadians, protecting a humpback feeding ground would seem like an important value in the Great Bear Rainforest, you start to see where the limits and the restrictions are on any idea of moving oil super tankers through such a narrow place. It’s just another bit of evidence, a bit of science that says this is difficult, if not impossible, and Enbridge’s project has made so many of those arguments more and more clear as we start to bring science to the table. Neither Enbridge Northern Gateway nor Apache, a partner in the KM LNG project, responded to a request for comment. The Canadian Coast Guard says it will undertake “a significant environmental response operation” because more oil is leaking from the sunken Second World War United States Army Transport vessel, the Brigadier General M.G. Zalinski. The Coast Guard says that an operation known as “hot tapping” will be used to remove the oil from the Zalinski. Hot tapping was used recently to remove fuel from the sunken cruise liner Costa Concordia off Italy and the container ship Rena which broke up off New Zealand. Hot tapping is a well-known and frequently used method of removing oil from the tanks of stricken vessels. Holes are carefully drilled into the side of the vessel to access fuel-tanks and then hot steam is pumped into the tanks. The steam increases the temperature of the oil and enables it to flow more easily. The oil is then pumped to the surface for safe disposal. The procedure can be done with holes of very small sizes up to very large diameters. Hot tapping is used in both marine and land-based scenarios. The Coast Guard recognizes that given their proximity to the Zalinski site and their interest in the oil recovery operation, the Gitga’at need to be informed on the progress of the operation and that they have important local knowledge and skill that will be beneficial to the operation. The Coast Guard says that environmental monitoring in January and March of 2013, discovered “further upwelling” of oil and added new patches to the sunken vessel. The USAT Brigadier General M.G. Zalinski was built in 1919 and served as a United States Army Transport vessel during the Second World War. It ran aground during a storm and sank in 1946 in the Grenville Channel about 100 kilometres south of Prince Rupert. According to a Coast Guard News release, the wreck was “undetected” until the fall of 2003 in 34 metres of water near an underwater cliff about 20 metres from shore. In September 2003, the United States Coast Guard Cutter Maple reported pollution in the Grenville Channel to the Canadian Coast Guard. The CCGS Tanu investigated the source of the pollution and collected oil samples, but, the news release says, the vessel remained elusive and undetected. A month later, more oil pollution was spotted so the Canadian Coast Guard used a remotely operated underwater vehicle which located the Zalinski. New pollution was reported in the channel in October 2003 by a commercial airline pilot and at this time the Coast Guard suspected that the source of the upwelling of oil was an old wreck. In 2003 and 2004, the Canadian Coast Guard contracted divers to patch the vessel to prevent the leak of oil. The Coast Guard says it regularly monitored the site with the help of Transport Canada’s National Aerial Surveillance Program. Local First Nations Groups also monitored the wreck site. More oil was spotted in April 2012, and at that time, contract divers patched the Zalinski with an epoxy that hardens underwater. The Coast Guard says new dive footage has shown that metal rivets that hold the hull’s plates are corroding and that the hull is buckling. as the state of the vessel deteriorates, the Coast Guard has determined that to prevent any harm to the environment, a significant operation should be undertaken to remove the oil from the vessel. The Canadian Coast Guard will be the on-scene commander for the duration of the operation, directing the recovery and the removal of marine pollutants from the vessel and actively monitoring the operation. The Canadian Coast Guard has also engaged the province of British Columbia and local First Nations groups to solicit their feedback on the operation. On July 26, 2013, Public Works and Government Services Canada posted two requests for proposal seeking a third-party to conduct the oil removal operation and oil spill response services to assist in the case that any oil leaks from the vessel as the operation progresses. It is expected that the operation will begin in September 2013 and will conclude in December 2013. The Coast Guard says because the Grenville Channel is so narrow, some restrictions on vessel traffic in the Inland Passage will be needed. The Grenville Channel is a narrow fjord-like waterway with significant tidal fluctuations and currents up to three knots. The shoreline is rocky and steep with little shoreline vegetation. The Grenville Channel sees commercial fishing vessels, ferries, cruise ships, and pleasure craft transiting its waters on a regular basis, with increased frequency in the summer months. These waters, naturally shielded from stronger offshore winds and weather conditions, are the preferred route of many cruise ships. The more mild sailing conditions and the stunning natural beauty of the area make the Grenville channel one of the scenic highlights of many marine travellers on Canada’s West Coast. 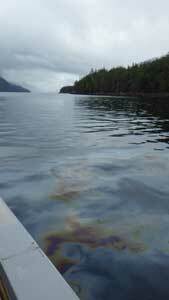 The Gitga’at First Nation at Hartley Bay report that a large oil slick has been spotted in Grenville Channel near Hartley Bay. It is believed that the oil is coming from the USAT Brigadier General M.G. Zalinski, a U.S. army transport ship that sank in 1946 with 700 tonnes of bunker fuel on board. A news release from the Gitga’at says the oil spill is between between two and five miles (four to eight kilometres) long and 200 feet wide (70 metres) inside the Grenville Channel. A Canadian Coast Guard vessel from Prince Rupert is expected in the area sometime this afternoon. The Gitga’at are sending their own Guardians to take samples and have chartered a plane to take aerial photos of the spill, the release says. The USAT Brigadier General M.G. 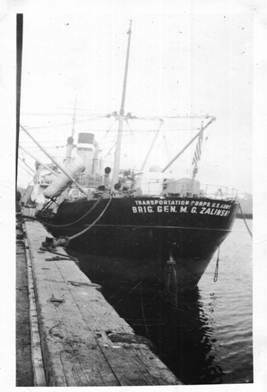 Zalinski was carrying Bunker C when it sank. The First Nation says the Canadian government has been saying it would remove the oil and munitions from the ship since 2006, but with no results. The spill is just the latest in a series of spills of bunker oil and diesel coming from the Zalinski and the BC Ferry Queen of the North, which sank in 2006. Despite government assurances of clean-up, both wreckages continue to leak fuel, fouling the marine environment, and heightening the fear of future oil spills. The Gitga’at depend on the ocean for 40 per cent of their traditional diet. According to Wikipedia, the Zalinksi was enroute from Seattle to Whittier Island, Alaska, when it struck rocks at Pitt Island on Grenville Channel 0n September 26 1946, 55 miles (88 kilometres) south of Prince Rupert. The ship sank within twenty minutes, while her crew of 48 were rescued by the tug Sally N and the passenger steamer SS Catala. According to a report in The Vancouver Sun on September 30, 1946, at the time of her sinking she was transporting a cargo of at least twelve 500-pound (230 kg) bombs, large amounts of .30 and .50 caliber ammunition, at least 700 tonnes of bunker oil, and truck axles with army type tires. Oil was first spotted leaking in Grenville Channel in 2003 and the wreck of the Zalinski was identified later that year by a remotely operated undersea vessel. 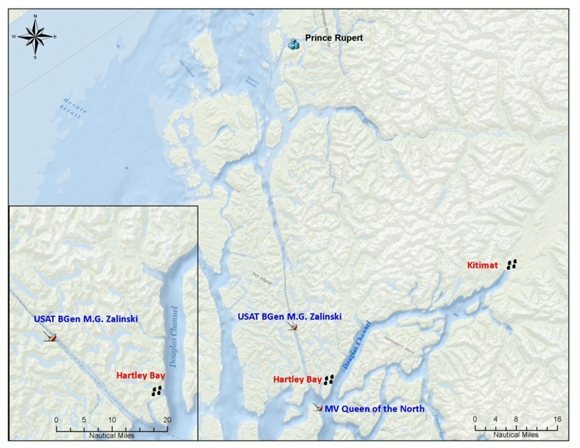 Hartley Bay is the entrance to Douglas Channel where tankers will go to Kitimat for the proposed Northern Gateway pipeline and three liquified natural gas projects. The Northern Gateway Joint Review panel has made major changes to the hearing schedule. Originally the schedule called for ten days of hearings in Prince Rupert. There are now seven days of hearings at Kitkatla, but not on consecutive dates. A new schedule released this morning shows new emphasis on the towns along the coast. Prince Rupert is now down to two days. Second update Feb. 1, 2012 The hearings at Bella Bella Feb. 3 and on Feb. 4, have been rescheduled to April 2 and 3, 2012. The Heiltsuk say the request to reschedule the hearings was made because key individuals important to the oral evidence were out of town on other commitments on the original February dates. The hearings at Hartley Bay will take place on March 3 and 4 at a location to be confirmed. At Kitkala, the hearings will be held on March 9. 12, 13, 14, 15, 16 and 19 at Lach Klan School William Shaw Memorial Gymnasium.